Mountain Biking Las Vegas and Southern Nevada is the real treasure found within Nevada, detailing over 40 of the greatest off-road mountain bike rides in the Las Vegas valley. Each route includes complete point-by-point miles and directions, map, text description of the riding area, GPS coordinates of the start/finish point, and full-color photos of the ride's features. More than just a trail guide, Mountain Biking Las Vegas gives the reader important information, such as local restaurants, restrooms, lodging, Las Vegas natural history, fauna, climate conditions, bicycle shops, other facilities for cyclists, and community resources. From the Redwood forests of northern California to Nevada's Red Rock Canyon, this land was made for mountain biking. With so much to explore in northern California and Nevada, it pays to have the inside scoop on mountain biking in the region. Mountain Bike! Northern California and Nevada will introduce you to the thrill of exploring this magnificent wilderness while helping you discover its most unforgettable rides. Mountain Bike! Northern California and Nevada provides detailed information on 50 of the best rides throughout the area, including Monterey Bay, Mount Shasta, Mount Saint Helena, Lake Tahoe. Great Basin National Park, and the Las Vegas desert. Here, glacial peaks, coastal hills, open valleys, desert canyons, and forested foothills provide some of the best mountain biking terrain in the country. Author Aimee Serrurier has uncovered a diverse collection of trails that offer something for bikers of all abilities. Whether it's a tame bike path, a rolling fire trail, or a challenging single-track, if it's a good riding, it's profiled here. Each route profile features: * a thorough ride description * a detailed trail map * helpful sources of information * proximity of important services * valuable commentary on elevation changes and possible hazards * a rescue index Mountain Bike! 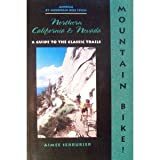 Northern California and Nevada also features interesting and entertaining photographs, vivid descriptions of native flora and fauna, a glossary of mountain biking terms, and tips on mountain biking etiquette.